Myelodysplastic syndromes (MDS) are a heterogeneous group of blood diseases mainly affecting older people. Deletion of the long arm of chromosome 5 (del[5q]) is reported in approximately 10–15 % of all MDS cases. Lenalidomide is an immunomodulatory, anti-cytokine and anti-angiogenic agent, which leads to red blood cells transfusion independence in patients of lower risk MDS with del(5q). This review briefly describes role of lenalidomide in treatment of lower-risk MDS with del(5q) as well as non-del-5q MDS. Recent evidence also suggest a potential role of lenalidomide in combination with other agents for treatment of higher-risk MDS. Jaykumar J Sejpal, Yogesh R Belagali and Hanmant V Barkate are employees of Intas Pharmaceuticals Limited. No funding was received in support of the publication of this article. 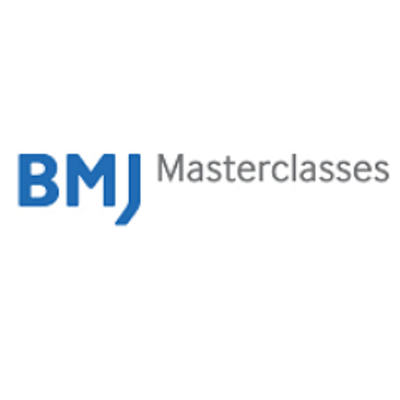 Lenalidomide was first studied in a single-centre 16-week, phase I/II trial.20 This study included 43 patients with MDS and who had transfusion-dependence or symptomatic anaemia. All patients were refractory to EPO or had high endogenous EPO levels. Lenalidomide was administered in three different dosing schedules: 25 mg daily, 10 mg daily and 10 mg/day for 21 days of a 28-day cycle. 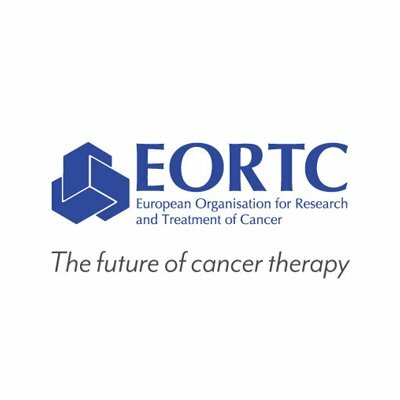 Results of this study showed the potential of lenalidomide in EPO-resistant del(5q) MDS as well as the role of lenalidomide in EPO-refractory non-del(5q) MDS patients. Eighty-three per cent of patients with del(5q) MDS showed major erythroid responses, defined as sustained transfusion independence, compared with 53 % of patients with normal karyotype and 12 % of patients with other karyotype abnormalities. Dosedependent myelosuppression (neutropenia, thrombocytopenia) was the most common adverse event (AE); well-tolerated dose was 10 mg daily for 21 days of each 28-day cycle. These landmark trials21,22 included adult patients with IPSS low- or intermediate-1-risk (lower risk) MDS associated with del(5q), with or without additional cytogenetic abnormalities. Included patients had RBC transfusion-dependent (TI) anaemia. Key patient characteristics, criteria for inclusion and exclusion and study methodologies are given in Table 1. In MDS-004,22 subgroup analysis suggested that erythroid response (RBC-TI for ≥26 week) rates favoured lenalidomide 10 mg over 5 mg for most subgroups. Particularly, in patients with baseline EPO levels >500 mIU/mL, the RBC-TI rate was significantly higher with lenalidomide 10 mg versus 5 mg (76.2 % versus 33.3 %; p=0.004). In MDS-00321, with lenalidomide 10 mg/day treatment, haemoglobin concentration increased from a median minimum of 7.8 g/dL during the baseline period to a median maximum of 13.4 g/dL during RBC-TI response period, with a corresponding median rise from baseline of 5.4 g/dL. In MDS-004,22 the median increase from baseline (value not reported) in maximum haemoglobin concentrations were 5.2 and 6.3 g/ dL with lenalidomide 5 and 10 mg regimens, respectively. Also, 60–67 % responders remained transfusion free at median followup of 1.55 years. In MDS-004,22 treatment with lenalidomide 5 or 10 mg regimens resulted in significantly higher cytogenetic response rates than placebo (see Figure 1). 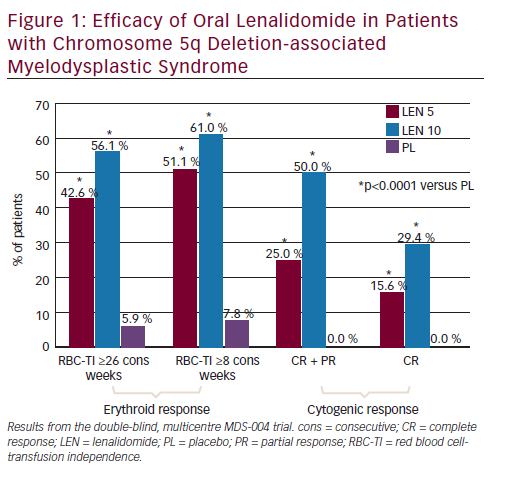 With lenalidomide 10 mg regimens, complete plus partial cytogenetic responses were achieved by 50 % and 73 % of patients and a complete cytogenetic remission was seen in 29 % and 45 % of patients in the MDS-00422 and MDS-00321 trials, respectively (see Figures 1 and 2). and 36.4 % of those receiving placebo throughout the study. Overall risk of AML progression for the lenalidomide dose groups combined was 16.8 % (95 % confidence interval [CI], 9.8-23.7) at 2 years and 25.1 % (95 % CI 17.1-33.1) at 3 years. A retrospective analysis by Kuendgen et al.,23 compared long-term outcomes in lenalidomide-treated and untreated patients with MDS with del(5q). This analysis used data of 295 lenalidomide-treated patients from two clinical trials (MDS-003 and MDS-004) and 125 untreated and RBC-transfusion-dependent del(5q) MDS patients (IPSS low- or Intermediate-1-risk category) from a large multicentre registry. The 2-year cumulative AML progression rates (95 % CI) in the lenalidomide-treated versus untreated cohorts were 6.9 % (93.3–13.9) and 12.1 % (7.0–20.3). Two-year OS probabilities (95 % CI) were 89.9 % (84.1–96.0) and 74.4 % (66.1–83.7), respectively. AML progression risk did not significantly differ in both groups (hazard ratio [HR] 0.969, p=0.930); however, treatment with lenalidomide led to significant improvement in survival (HR 0.597; p=0.012), after adjusting for all other covariates. Thus, lenalidomide treatment did not increase the risk of AML progression and conferred a possible survival benefit in RBC transfusion-dependent patients with lower risk del(5q) MDS. 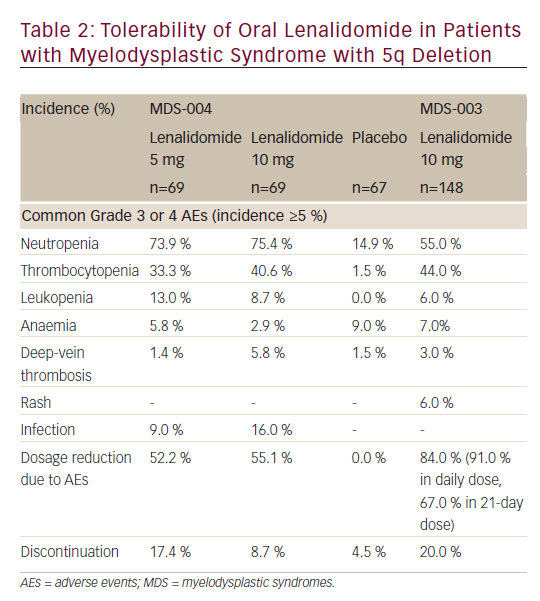 Oral lenalidomide (up to a dose of 10 mg/day) has a manageable safety profile in patients with del(5q)- MDS (see Table 2).21,22 Although many patients on lenalidomide experienced at least one grade 3 or 4 AEs in clinical trials, most were manageable with a dosage reduction and only ≤20 % of patients discontinued treatment because of AEs. In the MDS-004 or MDS-003 trial, the most commonly reported (incidence ≥10 %) grade 3 or 4 AEs with lenalidomide treatment were neutropenia, thrombocytopenia, leukopenia and infection. Most common adverse reactions (>15 %) include thrombocytopenia, neutropenia, diarrhoea, pruritus, rash, fatigue, constipation, nausea, nasopharyngitis, arthralgia, pyrexia, back pain, peripheral oedema, cough, dizziness, headache, muscle cramp, dyspnoea, pharyngitis and epistaxis. Grade 3 or 4 neutropenia and thrombocytopenia occurred more frequently during the initial two cycles of lenalidomide treatment and the incidence decreased with further cycles. MDS-002 was a multicentre, phase II trial evaluating lenalidomide therapy for transfusion-dependent patients with low- or int-1–risk (lower risk) MDS without any or with non-del(5q) chromosomal abnormalities (n=214).26 Patients received oral lenalidomide 10 mg daily or 10 mg/ day for 21 of a 28-day cycle. The most common grade 3/4 AEs were neutropenia (30 %) and thrombocytopenia (25 %). According to an intention-to-treat analysis, 26 % patients achieved TI after a median of 4.8 weeks of treatment. Median duration of TI was 41.0 weeks. In patients who achieved TI, the median rise in haemoglobin was 3.2 g/dL (range, 1.0–9.8 g/dL) from baseline. Overall rate of haematological improvement (HI) (TI response + ≥50 % reduction in transfusion requirement) was 43 %. Lenalidomide was found to have clinically meaningful activity in transfusion-dependent patients with lower-risk non-del-5q MDS. MDS-005 was a multicentre, double-blind, parallel-group international phase III study, which compared lenalidomide with placebo in RBCtransfusion dependent lower-risk MDS without del(5q) patients, who were unresponsive or refractory to EPO-stimulating agents (ESA).27 Patients were randomised in 2:1 ratio; to oral lenalidomide, 10 mg once daily (n=160) versus placebo (n=79). The primary endpoint was RBC-TI of ≥56 days, which was defined as absence of any RBC transfusions during any 56 consecutive days. Secondary endpoints were time to TI, duration of TI, TI of ≥168 days, progression to AML, OS and safety. Significantly more patients on lenalidomide achieved RBC-TI ≥56 days versus placebo (26.9 % versus 2.5 %; p<0.001). 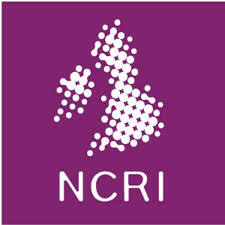 Ninety per cent of patients with TI responded within 16 weeks of treatment. For patients who became transfusion independent, the median duration of TI was 8.2 months (range 5.2–17.8). Additionally, RBC-TI ≥168 days was achieved in 17.5 % in the lenalidomide group and 0 % of patients in placebo group. The incidence of AML progression (per 100 person–years) was 1.91 (95 % CI 0.80–4.59) and 2.46 (95 % CI 0.79–7.64) for lenalidomide and placebo patients, respectively. The follow-up period was not long enough to analyse OS comparison. In the study, the most common AEs associated with lenalidomide were related to myelosuppression. Grade 3/4 neutropenia occurred in 61.9 % and 12.7 % in the lenalidomide and placebo groups, respectively, and grade 3/4 thrombocytopenia occurred in 35.6 % versus 3.8 %. This study provided new insights into the clinical results of lenalidomide in non-del-5q patients. Lenalidomide may offer this refractory patient population an additional option beyond their current limited choices. With lenalidomide’s success in lower-risk del(5q) MDS, it was further investigated for the treatment of higher-risk MDS. However, due to modest activity of lenalidomide monotherapy in higher-risk MDS, studies on lenalidomide in combination with other agents were required. A phase II trial by Sekeres et al. compared the addition of vorinostat or lenalidomide to azacitidine, with azacitidine alone. This study included 276 evaluable patients with higher-risk MDS, defined as intermediate-2 or high-risk IPSS score and/or bone marrow blasts ≥5 % (n=226), as well as patients with chronic myelomonocytic leukaemia (CMML) and <20 % blasts (n=50).29 Patients were randomised to one of three treatment arms: azacitidine 75 mg/m2 on days 1–7 of each 28-day cycle (n=92); azacitidine plus lenalidomide 10 mg/day on days 1–21 (n=93); or azacitidine plus vorinostat 300 mg twice daily (BID) on days 3–9 (n=91). The overall response rates were similar for all patients regardless of treatment arm; single-agent azacitidine (36 %), azacitidine plus lenalidomide (37 %; p=1.0 versus azacitidine monotherapy), or azacitidine plus vorinostat (22 %; p=0.07 versus azacitidine monotherapy). Also, the proportion of patients achieving CR, partial response (PR) and HI were similar across all treatment groups. Thus, compared with azacitidine alone, the combination of vorinostat or lenalidomide with azacitidine failed to improve response in patients with higher-risk MDS and CMML. The dose and schedule for azacitidine-lenalidomide combination used by Sekeres et al. might not be optimum.29 As lenalidomide inhibits cell cycle progression and effectiveness of azacitidine is dependent on cycling cells, sequential administration of azacitidine followed by lenalidomide might increase efficacy. To study such a schedule, DiNardo et al.30 conducted a phase I/II trial of the sequential combination of azacitidine followed by lenalidomide in high-risk patients with MDS and AML. During phase I and IIa, patients with relapsed or refractory AML or MDS with bone marrow blasts more than 10 % were included. Phase IIb included previously untreated patients with higher-risk MDS with up to 30 % blasts. 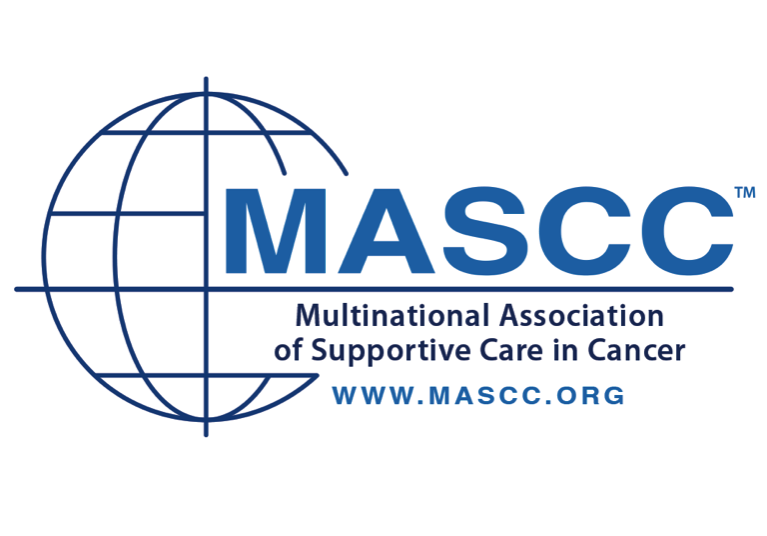 All participants received 75 mg/m2 azacitidine once a day for days 1–5 for each 28-day cycle. Oral lenalidomide was given for 5 or 10 days starting on day 6 in seven different doses in phase I design (n=28). In total 88 patients were enrolled, 28 in phase I and 60 in phase II. A maximum tolerated dose of lenalidomide in combination with azacitidine was initially considered as 50 mg per day for 10 days. However, due to the high rate of myelosuppression and myelosuppression-related toxic effects in the first 20 patients in phase II, the lenalidomide dose was revised to 25 mg per day for 5 days. Also in phase II patients with less than 30 % blasts were included to focus mainly on MDS. Median OS was 75 weeks for the 40 patients in phase IIb. The most common grade 3–4 AEs overall were neutropenic fever and pneumonia. Thus, this study found a safe sequential combination strategy for azacitidine and lenalidomide for patients with higher-risk MDS, 75 mg/m2 intravenous azacitidine once a day for 5 days followed by 25 mg oral lenalidomide once a day for 5 days. Also, this study provided preliminary evidence of activity of this schedule in patients with MDS. There are currently no sufficient data elucidating long-term benefits of lenalidomide therapy. Moreover, it remains unclear to decide when it can be discontinued. Further studies investigating the role of lenalidomide in lower-risk MDS without del(5q) and its role in higher-risk MDS in combination with other agents are warranted, which can give more clarity on the dosing schedule and efficacy of such combinations. Studies assessing the impact of long-term immunomodulation with lenalidomide and optimum duration of therapy in MDS patients would also be of interest. 1. Nimer SD, Myelodysplastic syndromes, Blood, 2008;111:4841–51. 2. Jädersten M, Hellström-Lindberg E, Myelodysplastic syndromes: biology and treatment, J Intern Med 2009;265:307–28. 3. 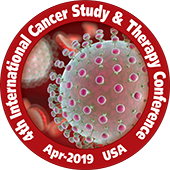 Rollison DE, Howlader N, Smith MT, et al., Epidemiology of myelodysplastic syndromes and chronic myeloproliferative disorders in the United States, 2001–2004, using data from the NAACCR and SEER programs, Blood, 2008;112:45–52. 4. 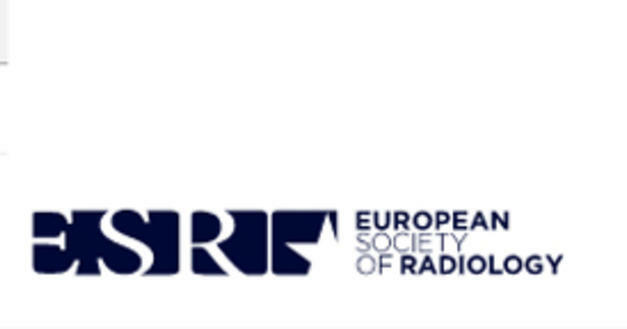 Fenaux P, Haase D, Sanz GF, et al., Myelodysplastic syndromes: ESMO Clinical Practice Guidelines for diagnosis, treatment and follow-up, Ann Oncol, 2014;25:57–69. 5. Greenberg P, Cox C, LeBeau MM, et al., International scoring system for evaluating prognosis in myelodysplastic syndromes, Blood, 1997;89:2079–88. 6. 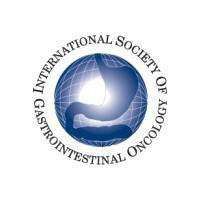 Greenberg PL, Tuechler H, Schanz J, et al., Revised international prognostic scoring system for myelodysplastic syndromes, Blood, 2012;120:2454–65. 7. Haase D, Cytogenetic features in myelodysplastic syndromes, Ann Hematol, 2008;87:515–26. 8. Haase D, Germing U, Schanz J, et al., New insights into the prognostic impact of the karyotype in MDS and correlation with subtypes: evidence from a core dataset of 2124 patients, Blood, 2007;110:4385–95. 9. Vardiman JW, Thiele J, Arber DA, et al., The 2008 revision of the World Health Organization (WHO) classification of myeloid neoplasms and acute leukemia: rationale and important changes, Blood, 2009;114:937–51. 10. Fenaux P, Kelaidi C, Treatment of the 5q- Syndrome. Hematology, 2006;2006:192–8 11. 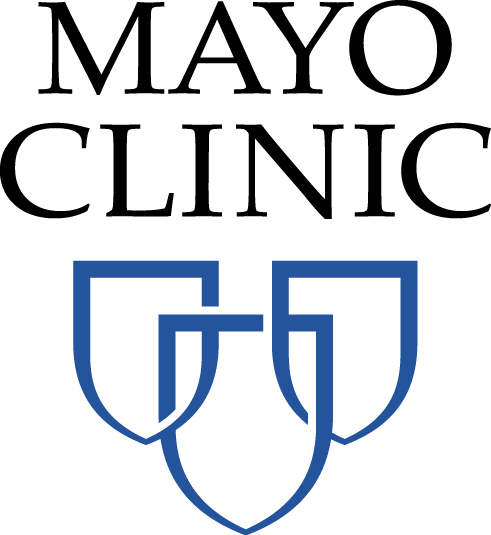 Mallo M, Cervera J, Schanz J, et al., Impact of adjunct cytogenetic abnormalities for prognostic stratification in patients with myelodysplastic syndrome and deletion 5q, Leukemia, 2011;25:110–20. 12. Kotla V, Goel S, Nischal S, et al., Mechanism of action of lenalidomide in hematological malignancies, J Hematol Oncol, 2009;2:36. 13. Anderson KC, Lenalidomide and thalidomide: mechanisms of action – similarities and differences, Semin Hematol, 2005;42(Suppl. 4):S3–8. 14. Galustian C, Meyer B, Labarthe M-C, et al., The anti-cancer agents lenalidomide and pomalidomide inhibit the proliferation and function of T regulatory cells, Cancer Immunol Immunother, 2009;58:1033–45. 15. Heise C, Carter T, Schafer P, Chopra R, Pleiotropic mechanisms of action of lenalidomide efficacy in del(5q) myelodysplastic syndromes, Expert Rev Anticancer Ther, 2010;10:1663–72. 16. Padron E, Komrokji R, List AF, Biology and treatment of the 5qsyndrome, Expert Rev Hematol, 2011;4:61–9. 17. Wobus M, Benath G, Ferrer RA, et al., Impact of lenalidomide on the functional properties of human mesenchymal stromal cells, Exp Hematol, 2012;40:867–76. 18. 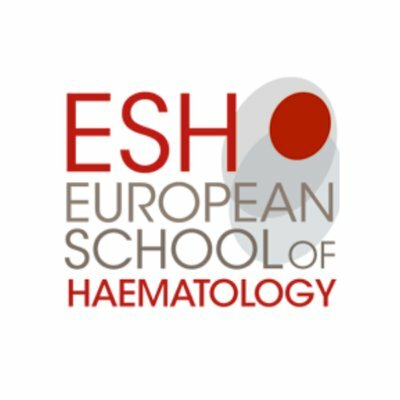 Hoefsloot LH, van Amelsvoort MP, Broeders LC, et al., Erythropoietin-induced activation of STAT5 is impaired in the myelodysplastic syndrome, Blood, 1997;89:1690–700. 19. Dredge K, Marriott JB, Macdonald CD, et al., Novel thalidomide analogues display anti-angiogenic activity independently of immunomodulatory effects, Br J Cancer, 2002;87:1166–72. 20. List A, Kurtin S, Roe DJ, et al., Efficacy of lenalidomide in myelodysplastic syndromes, N Engl J Med, 2005;352:549–57. 21. 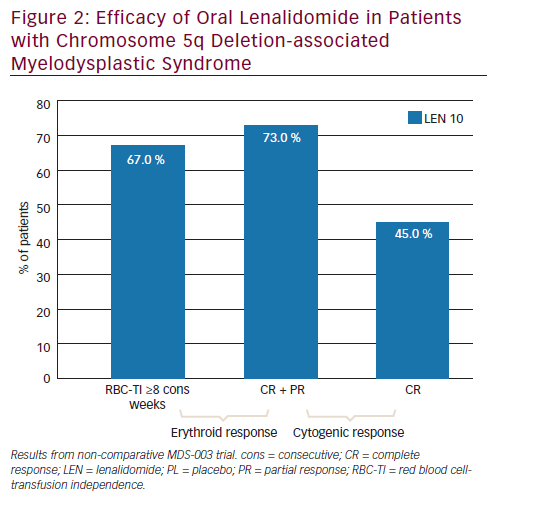 List A, Dewald G, Bennett J, et al., Lenalidomide in the myelodysplastic syndrome with chromosome 5q deletion, N Engl J Med, 2006;355:1456–65. 22. Fenaux P, Giagounidis A, Selleslag D, et al., A randomized phase 3 study of lenalidomide versus placebo in RBC transfusion-dependent patients with Low-/Intermediate- 1-risk myelodysplastic syndromes with del5q, Blood, 2011;118:3765–76. 23. Kuendgen A, Lauseker M, List AF, et al., Lenalidomide does not increase AML progression risk in RBC transfusiondependent patients with Low- or Intermediate-1-risk MDS with del(5q): a comparative analysis, Leukemia, 2013;27:1072–9. 24. 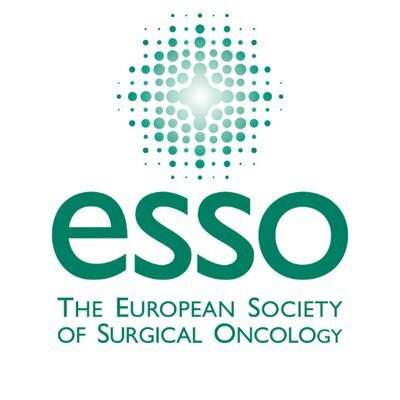 Fenaux P, Haase D, Sanz GF, et al., Myelodysplastic syndromes: ESMO Clinical Practice Guidelines for diagnosis, treatment and follow-up, Ann Oncol, 2014;25(Suppl. 3):iii57–69. 25. 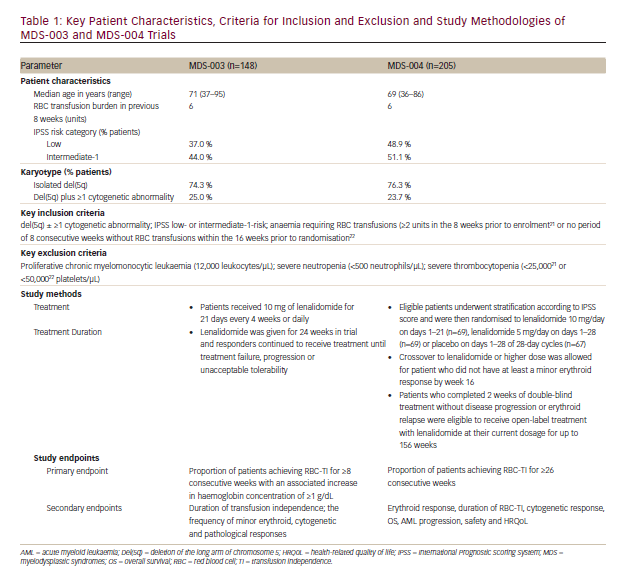 Revicki DA, Brandenburg NA, Muus P, et al., Health-related quality of life outcomes of lenalidomide in transfusiondependent patients with Low- or Intermediate-1-risk myelodysplastic syndromes with a chromosome 5q deletion: results from a randomized clinical trial, Leuk Res, 2013;37:259–65. 26. 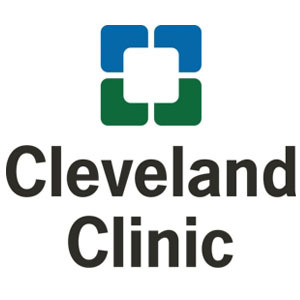 Raza A, Reeves JA, Feldman EJ, et al., Phase 2 study of lenalidomide in transfusion-dependent, low-risk, and intermediate-1–risk myelodysplastic syndromes with karyotypes other than deletion 5q, Blood, 2008;111:86–93. 27. Santini V, Almeida A, Giagounidis A, et al., Efficacy and safety of lenalidomide (LEN) versus placebo (PBO) in RBC-transfusion dependent (TD) patients (pts) with IPSS low/intermediate (Int-1)-risk myelodysplastic syndromes (MDS) without Del(5q) and unresponsive or refractory to erythropoiesis-stimulating agents (ESAs): Results from a randomized phase 3 study (CC-5013-MDS-005), Blood, 2014;124:409–409. 28. 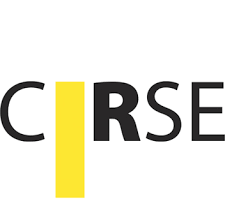 Sekeres MA, Tiu RV, Komrokji R, et al., Phase 2 study of the lenalidomide and azacitidine combination in patients with higher-risk myelodysplastic syndromes, Blood, 2012;120:4945–51. 29. 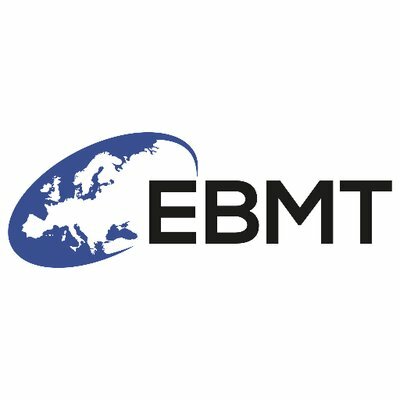 Sekeres MA, Othus M, List AF, et al., A randomized phase II study of azacitidine combined with lenalidomide or with vorinostat vs. azacitidine monotherapy in higherrisk myelodysplastic syndromes (MDS) and chronic myelomonocytic leukemia (CMML): North American Intergroup Study SWOG S1117. Presented at American Society of Hematology (ASH) Annual Meeting, 6–9 December 2014; San Francisco, CA. Abstract LBA-5. 30. DiNardo CD, Daver N, Jabbour E, et al., Sequential azacitidine and lenalidomide in patients with high-risk myelodysplastic syndromes and acute myeloid leukaemia: a single-arm, phase 1/2 study, Lancet Haematol, 2015;2:e12–20. 31. 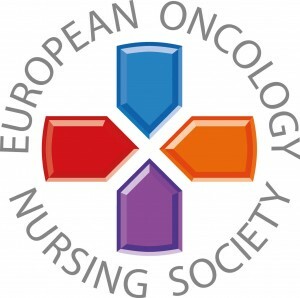 NCCN Clinical Practice Guidelines in Oncology [Internet]. Available from: https://www.nccn.org/ (accessed 30 August 2015). 32. Celgene Corporation. REVLIMID [lenalidomide] capsules, for oral use: prescribing information. [Internet]. 2013. Available from: https://www.accessdata.fda.gov/drugsatfda_docs/ label/2013/021880s038lbl.pdf (accessed 30 August 2015). 33. European Medicines Agency. Revlimid (lenalidomide): summary of product characteristics. 2013 [Internet]. 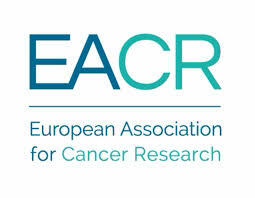 Available from: https://ec.europa.eu/health/documents/communityregister/ 2013/20130613126109/anx_126109_en.pdf (accessed 11 November 2015).